Fig. 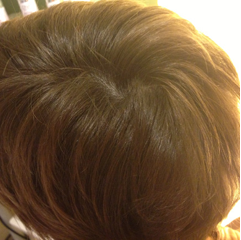 1: Photo by patient prior to treatment. “Janie” was clearly suffering when we first met. Entering my office she appeared embarrassed, with long pieces of hair wrapped around her head in an attempt to cover up her bald spots. As she described her situation in a shy, soft-spoken voice, it became clear that she was going through a very stressful time. 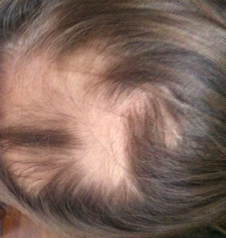 Janie explained that it had been eight months since the initial onset of her Alopecia Areata (AA), an autoimmune disorder in which the body’s immune system attacks hair follicles, resulting in clearly defined bald patches across the scalp. Western treatments for AA include topical as well as injected steroids. Other “tips” for managing AA involve covering the scalp with wigs, hats and scarves, and reducing stress, which is believed to exacerbate the condition. Janie first learned of her problem when her husband pointed out that she was losing hair on the top of her head. Over time her AA progressed from her crown to include the hairline, just above the forehead, as well as the occipital ridge and the area just above her right ear. In time her hair loss became very noticeable and difficult to cover-up. When I first examined Janie’s scalp areas with a magnification lens I was surprised to find tiny, fine white hairs growing in the affected areas. This was especially interesting since Janie is young — only 31-years-old — with no other white hairs among the mousey-brown hair covering the rest of her head. Prior to contacting me Janie had been under the care of a dermatologist for five months. Her treatment primarily consisted of steroid injections directly into the affected scalp – a painful process that clearly wasn’t working. As a result, Janie was sad, scared, and eager to find a solution for her condition. As I interviewed her a clear picture of Janie’s life began to emerge. As a 31-year-old marketing professional she typically worked a 40-hour week, subsisting on a Standard American Diet (SAD) consisting of breads, cheese, packaged foods, sandwiches, alcohol and sweets, augmented with caffeine and cigarettes. As the 7th of 8 children in her family, she had suffered from frequent ear infections during childhood, which resulted in rounds of antibiotic therapy. First, I wanted her to clean up her diet by eliminating processed meals and other foods known to promote inflammation and negatively affect the immune system. Second, I implemented a stress-reduction program that included promoting good quality sleep. Next, the use of guided imagery and acupuncture treatments for 4 to 6 weeks to restore and equalize her immune system. And finally, select supplements and botanicals to enhance the constitutional support needed to stop the autoimmune process and facilitate new hair growth. I asked her if she would be interested in working with botanicals to help with the hair re-growth. Janie was agreeable to trying the herbs. Janie was determined to get results and 100% compliant with her prescribed treatment regimen. She came in for weekly acupuncture treatments and took the herbs and supplements as prescribed. She implemented stress reduction strategies and was newly mindful of her diet. Fig. 2: “Janie” after 3 months of treatment involving acupuncture and PriaPlex®. Photo by Amy Petrarca, BiaoHealth. Janie was enjoying her acupuncture sessions and herbal therapy. She was obviously benefiting from the results as evidenced by the new hair growth as well as a notable change in her demeanor. She rated her stress level “lower” than when we first met, and seemed less tense with each visit to my clinic. Bensky, D., Clavey, S., and Stoger, E. (2004). Chinese Herbal Medicine Materia Medica. (3rd Edition). Seattle, WA. Eastland Press. p. 710, 718. Bensky, D., and Barolet, R. (1990) Chinese Herbal Medicine Formulas and Strategies, Seattle, WA, Eastland Press, p. 273, 274. Gongwang, L., and Hyodo, A. (1994) Fundamentals of Acupuncture & Moxibustion, Nankai District, Tianjin, P.R. China. Tianjin Science and Technology Translation and Publishing Corp. p 58, 59. By Amy Petrarca, MS, RN, L.Ac. . Dipl. OM. Otherwise healthy, Janie’s initial assessment included evidence of a Yin Deficiency and Blood Deficiency pattern, which included increased thirst, night sweats, and salt cravings. From a Traditional Chinese Medicine Perspective, this case study involves both a Pre-Heaven (or Pre-Natal) deficiency, as well as a Post-Heaven (Post-Natal) deficiency. The Pre-Heaven deficiency involves both Kidney Qi and Essence. The Post-Heaven deficiency involves all three components of a healthy immune system, Lung, Spleen, and Kidney (or Metal, Earth, and Water). The Lungs are suffering from smoking, literally burning the yin and creating some toxicity and heat. The Spleen is deficient in what it receives and in turn is unable to make healthy Qi and Blood. The patient has suffered from night sweats for two years and has an insatiable salt craving – helping to identify her Kidney Yin deficiency. What is so beautiful about Tango’s PriaPlex formula is how nicely the ingredients come together to support Qi, Blood, & Yin. Comparing the formula to the ancient “Qi Bao Mei Ran Dan” (Seven ingredients for Beautiful Whiskers) formula from the Analytic Collection of Medical Formulas (Yi Fang Ji Jie), there are many similarities in herbal function, but they are quite different in an ingredient list. Along with the powerful blood tonic, Dang Gui, we see a beautiful balance of Yin Tonics in PriaPlex. As stated in Fundamentals of Acupuncture & Moxibustion (Gongwang & Hyodo, 1994, p.58-59), “The state of kidney essence and Qi directly affects the growth and loss, and overall condition of the hair. The Head Hair is a manifestation of Kidney Blood. In Traditional Chinese Medicine, we don’t see a lot mentioned about Kidney Blood, except when it “sprouts” to the head hair specifically. Han Lian Cao is a classic Yin tonic, helpful for “blackening the hair” in ancient texts – especially when used with Nu Zhen Zi, also a Yin tonic. Together, these two herbs make up another classic formula, Er Zhi Wan, which powerfully treats night sweats and other signs of yin deficiency heat. The utilization of Huang Qi in Tango’s PriaPlex is very interesting indeed. Huang Qi travels to the Lung and Spleen, both rectifying the Spleen Qi and benefiting the Lung Qi – especially as it relates to the exterior and the sweat pores. Huang Qi has an acscending quality, lifting to Bai Hui (Du 20) and strongly guiding the formula to the head, perhaps even to the vertex particularly. The use ofRen Shen potentiates the benefit of Huang Qi – and is able to strongly strengthen the exterior while also supporting the Yin internally.